Rakhi is not just about the whole world of sweets. 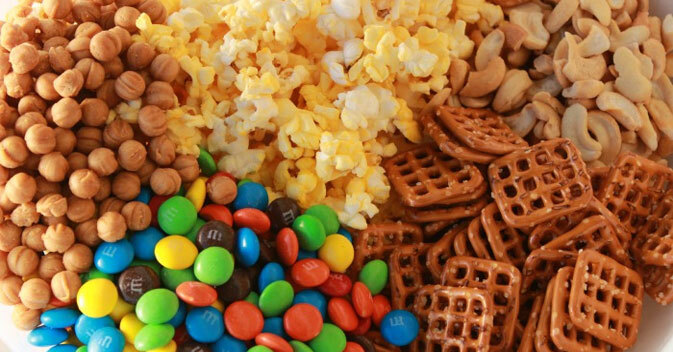 It is equally enjoyed with salty snack mix. When there is too much of sweets, chocolates, nuts, caramel and cakes, people really enjoy the different salty snack mix for a change. Even as part of Rakhi celebration, sisters or brothers sometimes give assorted snack packs to each other. So, enjoy both sweets and salty snacks during Rakhi celebration time. Rakhi celebrates a very special relation shared by siblings. It marks the relation of love, warmth, and faith between brothers and sisters. Celebrated all over the world, Raksha Bandhan has deeper connotation and significance. Raksha means protection and Bandhan means bond. Taken together, it is bond of protection and love that is tied on a brother's wrist. With this ritual there is gift giving and gift receiving. Besides material gifts, you can also send across best wishes with eatables like sweets and salty snack mix. For a health conscious sibling, salty snack mix is an excellent gift item. Salty foods and nuts and varied snack options appeal to a wide variety of tastes. There is magnetizing range of salty fries, oven-baked snacks in spicy, cheesy and BBQ flavors. These are simply irresistible and you just cannot put your hands off these lip smacking and luscious salty snack mix!! In recent times, snacking is just not limited to potato chips. It goes way beyond it and you have umpteen choices. Indeed, there is every variety of popular snack and food items for every taste. It consists of pepperoni, sandwiches, chips, hot dogs, nuts and trail mix. Then, there are peanuts, pumpkin seeds to sunflower seeds, and different flavors of corn that be purchased as salty snack mix. sendrakhi.com offers you interesting insight into salty snack mix. Let the taste buds tickle with sweet and salty gifts on Rakhi festival.